When Arrested Development crept onto the scene in 2003, its adult cast was filled with comedic ringers—from Jason Bateman, shrugging off his former teen-idol image, to Jeffrey Tambor, making his first significant run at TV comedy since The Larry Sanders Show. But the show also called for a couple of teenagers, one in the role of the main character’s son, who would play straight man to the straight man. 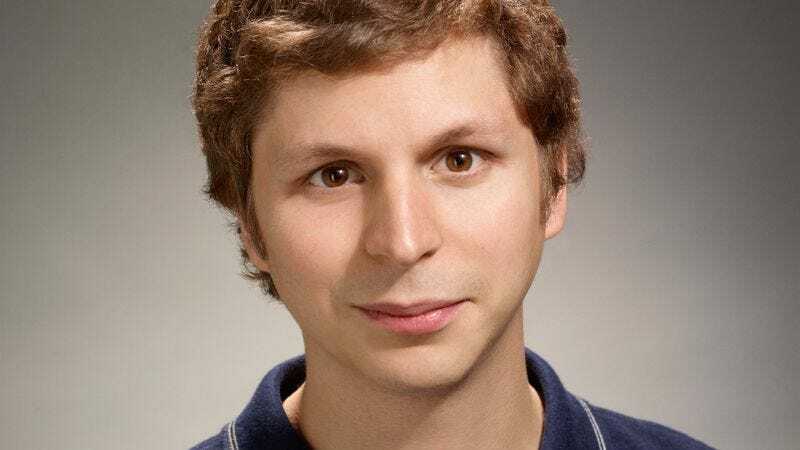 As that son, George Michael Bluth, the quiet and unassuming Michael Cera made an instant name for himself as a kind of archetypal nice guy, the kid who does the right thing and tries like hell to overcome his crush on his cousin. In the years since Arrested left the air, Cera has found substantial success in film, starring in movies like Superbad, Juno, and Scott Pilgrim Vs. The World, but he’s returned to the role that first made him famous—both as an actor and as a member of the fourth season’s writers’ room. He’ll also star this summer in This Is The End, the directorial debut for his Superbad screenwriters Evan Goldberg and Seth Rogen, in what seems like a conscious attempt to play against type. The A.V. Club sat down with Cera to talk about writing for Arrested Development, how George Michael has changed in the last seven years, and whether he’s trying to break out of “the nice kid” role. The A.V. Club: What was the trickiest aspect of stepping back into a role that you hadn’t played in a while? Michael Cera: I would say finding the rhythm of the humor in the beginning was a trick. Just remembering how to play it is very specific. But that kind of clicked into place after the first day. AVC: In the first episode back, the first thing it says underneath your name is “a nice kid.” From the trailer, it seems like you’re pulling away from that type in This Is The End. How interested are you in breaking out of the type of role you frequently play? MC: I don’t know. Breaking out is a very active way of putting that. I think it’s less active than that. I think the kind of roles that you’re able to play as an actor, you’re sort of at the mercy of opportunity. The only thing I really ever care about is who’s directing it, who else is going to be in it, and will I like it. That’s a very spoiled approach, I think, but I’m fortunate enough right now to not have to work to support a family. [Laughs.] So that’s nice. But yeah, that’s really the only consideration right now. AVC: When you started the show, you were a teenager; now you’re an adult. What kind of perspective do you think you have coming back to it? MC: Well, I’ve always known that it was probably the significant moment of my life, getting to do this show. I don’t think that’s overstating it. I got to work with people who were very important to me. It was really formative for me. It really defined what I care about. AVC: When you stepped into this new season, did Mitchell Hurwitz have your backstory kind of mapped out? Did he know where the character had been in the seven years since the show’s been away? MC: By the time I showed up and we started into production, that stuff had been broken, all that background story. It had been pretty much figured out. AVC: Did he sit down and tell you all about it? MC: Yeah, the first day Mitch told me all about the story of the whole season. You go into his office, they have rows of cue cards. Basically every character has a track that wraps around the room of cue cards that are just events overlapping with other people’s stories. And it’s just this thing that you look at, and it doesn’t make any sense, like staring at The Matrix code. [Laughs.] So they had already really done so much work at that point. You don’t understand the whole thing at all, even now until you watch it, I think. AVC: Did it make sense at first, or did it take a while to get into the rhythm? MC: It starts to make sense once you learn the language of this new season. It’s exciting being confused by it and trying to figure it out. It’s really like learning a new language. And for the entire time I was in the [writers’] room, there was not a day that went by that I wasn’t lost. Some days there would just be story discussions, and you’d just be sitting quietly, just confused. Just trying to enjoy watching this process coming together. I was always thankful that I never had any responsibility. [Laughs.] I don’t know how those guys did it. AVC: And what did you learn about writing for TV and movies from being in the writers’ room on this season? MC: Nothing that would ever apply to any other project. It was very specific. But one thing you physically learn is there are good days and bad days, in terms of your own confidence. You show up, and some days, you’ll really pull your weight and get a few big laughs in the room or think of a really good direction or something, and other days you’re completely useless. And you don’t have your confidence hanging in the balance of every day. You just learn that’s how it goes. Everyone experiences that. That was valuable. AVC: From having seen a bit of this season, it seems George Michael is slightly more confident than he was in the past. AVC: How do you approach that and still make him recognizable? MC: I think that’s a believable trajectory for a guy like that. I think there’s a lot of Mitch Hurwitz in the character. Probably in high school he was sure of himself, but socially struggling. As you go into college and you move out and you start making people laugh or you make friends, you sort of get the idea that growth happens. [Laughs.] And changes happen. So I think it was a totally organic step for him. AVC: Did you change the way you played the character at all? MC: No. You know, you just play each scene. There’s not a key to playing the character, I think. It’s all in the writing, really. AVC: George Michael’s relationship with his father has become really codependent in a different way, with his father being more dependent on his son. Was it fun to play the flip side of that relationship? MC: Yeah, I loved it. And I loved seeing Jason [Bateman] do that. I think it’s really fun to watch. That’s something you don’t ever really see with his character, being vulnerable in that way with his son. It’s kind of the one place where he always had the higher ground. And then he’s really vulnerable in those moments. It was some really nice acting. AVC: Did you have any sense of how the writers broke this huge story down into an episodic level? MC: That was constantly happening, constantly changing. Nothing was ever concrete until it was shot, and even after it was shot, it was subject to being reshot or changed. The other thing I learned, getting to watch Mitch in the editing room for a day, is he is constantly evolving it even in post-production with the voice-over, with Ron Howard’s voice-over. He’ll rewrite voice-over lines and add ADR lines and completely change the intent of the whole scene. Just by setting it up differently, it’ll mean something totally different. So he’s constantly evolving it. It’s never set. And that takes a lot of confidence and a lot of ability. And faith. So it was nice to see him doing that and having such a great attitude about it the whole time. AVC: The show was so fast-paced, and it still is, but you’re filling out a longer running time than in the Fox episodes. What was your sense of how you filled out that time while keeping the pace going? MC: Well, that was a unique challenge. There was nothing really dictating how long the episodes had to be, I think. It was kind of just whatever intuitively felt right. There was so much story that getting the characters’ episodes down to a half-hour was almost the biggest challenge in the end—just what to take out and how to justify everything. But I do think it’s constantly moving, and it’s got the same high rate of jokes, and I think it sustains itself for a full half-hour.